If you have been looking into VPN reviews, it’s likely you’ve read or heard about ExpressVPN. ExpressVPN is one of those providers that’s (almost) always on the list of favorites of VPN users, reviewers, and even tech publishers. In this review, we will take a look at why ExpressVPN is such a well-known and beloved VPN. So, without further delay, let’s find out why ExpressVPN is an obvious contender for “The Best VPN” title. Servers and Locations: 3,000+ and growing! High server counts are usually synonymous with a good VPN service. ExpressVPN isn’t ashamed of showing off their very respectable 3,000+ VPN servers located in 94 countries; it’s a number delivered by the highest-tiered VPN services. Having that much selection allows you to choose a server that fills whatever your jurisdictional need is. In total, they operate within 96 countries – all of which allow OpenVPN. No matter how secure or private a VPN can get, it’s not usable when your speeds are slow. Thankfully, ExpressVPN does not throttle uncontrollably. In fact, we’ve got very decent speeds with ExpressVPN! We did some testing from our testing locations to major server points around the world. Just take a look at the speeds that we could get from a server in Hong Kong. Considering that all that data had to travel 8,000+ miles across the Pacific Ocean, this speed is totally respectable. Despite some loss in speeds, we really can’t complain about the results we’ve got. Most VPNs would perform significantly poorer anyway; in reality, these speeds are more than enough for Ultra HD streaming and downloading files even with multiple users sharing bandwidth allocations. Netflix is one of those streaming providers that’s incredibly aggressive in blocking proxy servers from getting access to their content. If your VPN provider is able to unblock geo-restrictions on Netflix, you’d know that you have a VPN provider that constantly updates their IP addresses. It’s also a sign your VPN provider is always up-to-date when updating and maintaining their servers. Apart from being able to watch your favorite shows, you’re also assured of a secure and private connection! 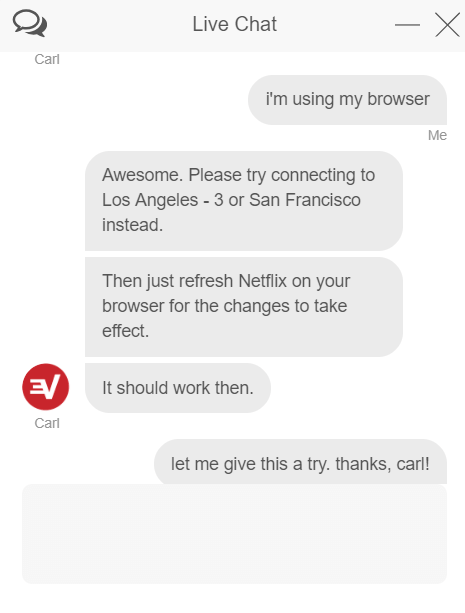 We’ve asked their 24/7 live chat to recommend a server where Netflix would work best. The customer service rep mentioned a few servers and Netflix worked! (More on ExpressVPN’s great support later). It will always be expected that Netflix will not work with all servers, especially given the enormous server count. With ExpressVPN, it’s not unlikely that you would run into Netflix’s dreaded “black screen” either. The support staff that provides an up-to-date list of working servers is more than enough reason for us to trust ExpressVPN for our streaming needs. For these reasons, we’ve featured ExpressVPN at the top of our list of best VPN providers for Netflix. It’s that good. Torrenting Policy: No problems here! While not being boldly advertised, ExpressVPN works well on torrent downloads and peer-to-peer file sharing. We have tried downloading some files through some of the more popular torrenting services like uTorrent, qBittorrent, Vuze, and Deluge and not a single problem came up. Despite not being so overt when it comes to their torrenting policy, they know that their users are still going to use ExpressVPN for torrenting anyway. As seen on their Terms of Service page, ExpressVPN does not exactly condone piracy. But then again, they can’t see your activity nor can they see what you download and stream through their servers. ExpressVPN would rather leave this to your conscience. Their overall torrent-friendly policy puts them on our featured picks for the best VPNs for torrenting though! While I’m not exactly a big fan of VPNs that don’t offer an easily downloadable trial, we still went on to purchase a month’s subscription of ExpressVPN for this review. If ever we feel that ExpressVPN isn’t for us, they offer a 30-day money-back guarantee anyway. We have reviewed a lot of VPNs in this website and we can confidently tell you that 30 days is really more than enough time for you to decide if you like a service or not. Most VPN providers will only offer a 7-day trial or less. Despite being a really great service, ExpressVPN has been generous enough to let users try their product for 30 days; this is quite unusual among VPN providers. 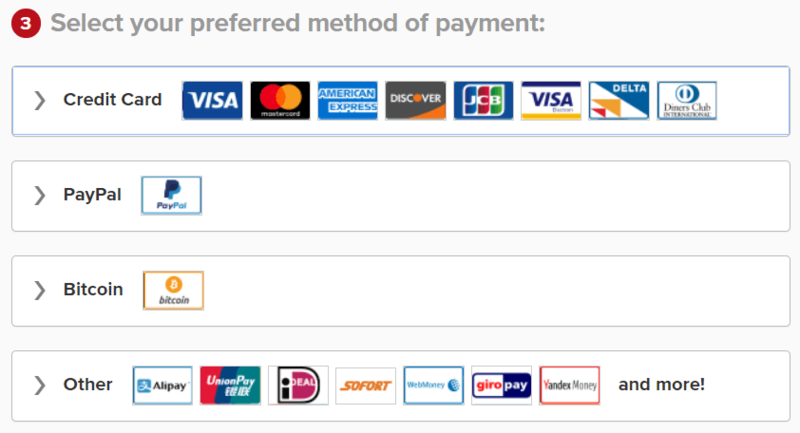 ExpressVPN did not skimp at all on their payment options, you can subscribe with most major credit cards, PayPal, Bitcoin, and others. Having a Bitcoin option would be very comforting for those who value total anonymity as this makes you even more untraceable. One thing thing to mention before we get into how ExpressVPN works on virtually anything, we should mention a little caveat: ExpressVPN allows only up to 3 simultaneous connections. 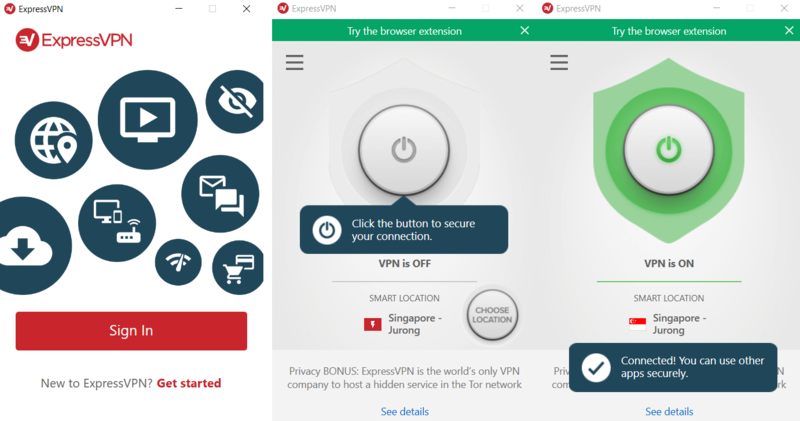 Customers can easily get around this by enabling ExpressVPN on their router. One of the reasons why ExpressVPN is really hard to match by other VPN providers is the amount of device support they offer. It would definitely be harder to find a device that ExpressVPN can’t support than finding devices that work. 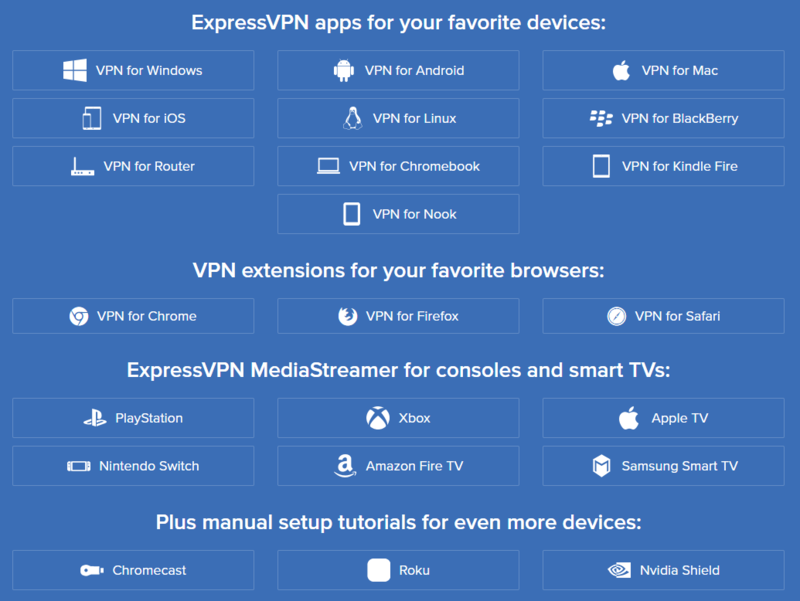 ExpressVPN has made sure that they’ve had every operating system, mobile device, gaming consoles, and smart TVs covered. They also have support for routers in case your setup is a little different. The website teaches you in simple instruction how to set up a VPN on your router. 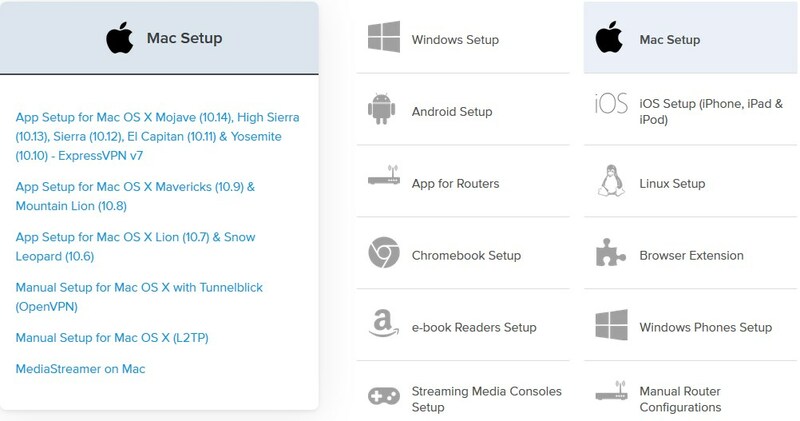 Not only does this allow you to have a VPN on unlisted devices; this also increases the number of devices that you can simultaneously connect on their network! Sign-Up Process: It’s really easy! 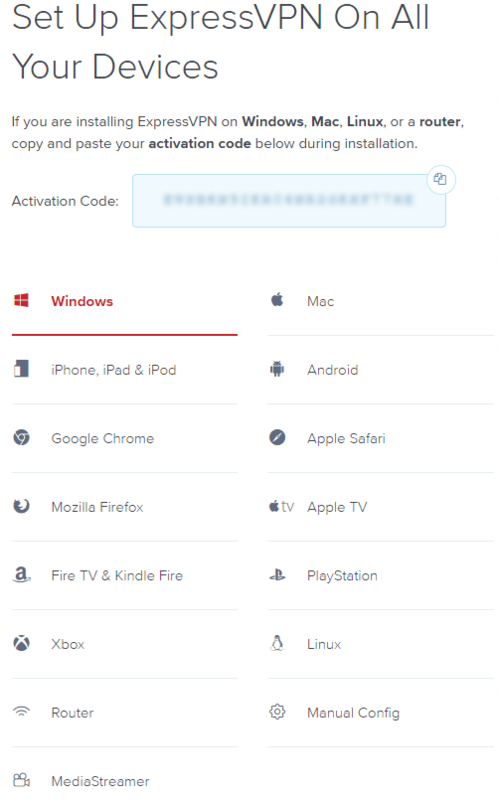 Once you’ve finalized the purchase of your ExpressVPN subscription, you will be given an activation code and a password. A list of devices will also be shown; you can select any of these devices and a setup guide will be available for you read and follow. ExpressVPN also has a YouTube Channel that shows you easy-to-follow instructions to set up your devices. We always say this in our reviews; if the UI is easy enough for technology-inept mothers to use, then we have a VPN that anyone can use. Once you’ve signed in on the app, it takes one press of a button to have your connection be on a private and secure network. We don’t think anyone could mess this up. A simple click would already allow you to browse the internet safely and anonymously. More advanced users and those who like to play around with the settings would also appreciate the UI, as more advanced options are well-organized in the menus. 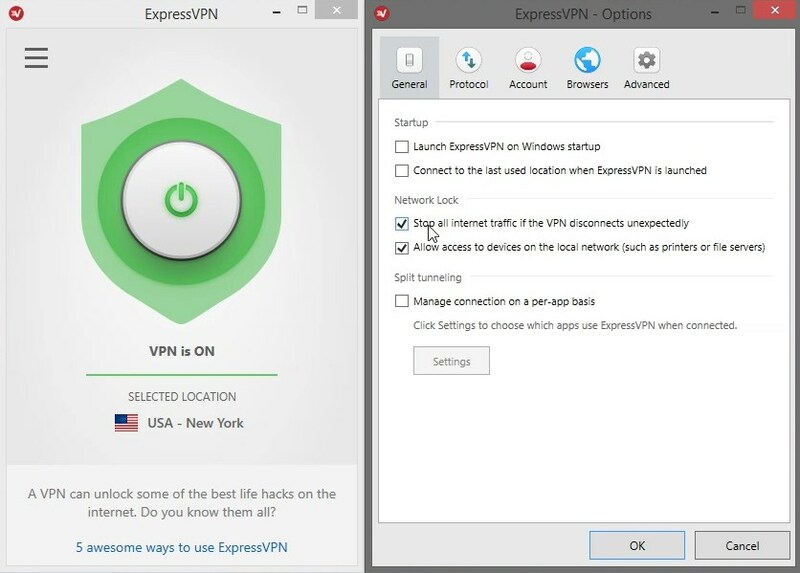 ExpressVPN is indeed a VPN for anyone! Customer Support: Live chat that answers instantly! The hallmark of a great VPN provider is a fast 24/7 support with the right answers you need. We asked one of their customer service reps to recommend a server where we could watch on Netflix without encountering any blocks. My inquiry was answered in less than the time it takes for me to open Netflix. Their support is FAST and we cannot stress that enough. There’s nothing left to say here about their support; best to try it out for yourself. With such amazing customer service, you could just decide to be lazy and ask their customer service reps everything. But if you decide to give them a break and troubleshoot on your own, the information on their website is resourceful. They have a plethora of help articles for every device. The documentation includes everything from knowing what a VPN is for, setting up your VPN, and even troubleshooting on your own. If reading isn’t your thing; as mentioned earlier, there’s a YouTube channel that shows you guides in an easy-to-follow delivery style. A lot of VPN providers would claim that they have no logs yet use third-party DNS that does not have the same level of encryption as their VPN, this leaves a level of vulnerability in your internet privacy. While they boast having a no log policy, this doesn’t mean they don’t record anything. This is a common practice in the industry, actually. VPN companies claim to operate under a zero log policy, but current technologies makes it difficult to make this happen. It should be noted that none of the listed above can be used to match an individual to specific network activity or behavior. This means in case you’re ever in trouble, the data collected can’t help the authorities. ExpressVPN sticks to their promise of not storying any activity logs and connection logs. In 2017, ExpressVPN’s policies were tested – the Turkish authorities demanded customer activity information, but due to ExpressVPN’s infrastructure, ExpressVPN could not provide evidence that showed which customer was involved. Apart from having a strict no log policy, ExpressVPN uses their own encrypted DNS which assures you that there will be no data breach or whatsoever. IP and DNS Leak Test: Zero leaks! A simple IP/DNS leak test would show you if your VPN has vulnerabilities. ExpressVPN passes this with flying colors, this means your identity and online activity will not be disclosed anytime soon. When it comes to security, nothing beats a 256-bit AES encryption. Today’s hackers (or government entities) can only dream of being able to penetrate the level of protection that ExpressVPN offers. More than that, ExpressVPN offers a lot of security protocols which includes OpenVPN. All facets of ExpressVPN’s security just goes beyond industry standards. Users should feel nothing but confidence when they’re connected to ExpressVPN’s servers. 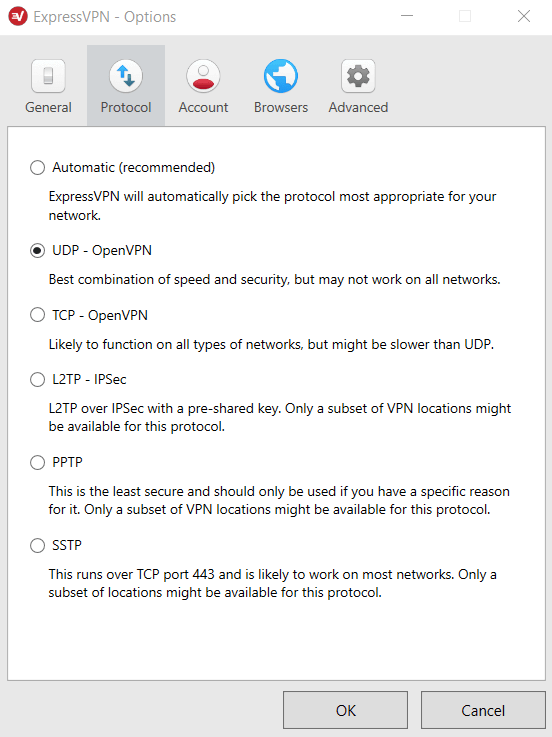 Kill Switch: It’s no surprise ExpressVPN has one – seems they’ve nailed just about everything here! ExpressVPN has a security feature called “Network Lock”, which is basically a kill switch. This protects your connection from any unwanted identity exposures; the moment you lose connectivity, the kill switch will automatically block your connection to prevent leaks of any kind. This added layer of protection makes your VPN even more secure and ExpressVPN, of course, has it. All you need to do is make sure the checkbox is checked if it isn’t already on by default. Let’s face it: ExpressVPN isn’t the cheapest VPN. In fact, it’s considered a premium VPN provider. With numerous VPN providers sprouting out from here and there, subscriptions are getting cheaper and cheaper. Unfortunately, we don’t see ExpressVPN’s price getting cheaper. 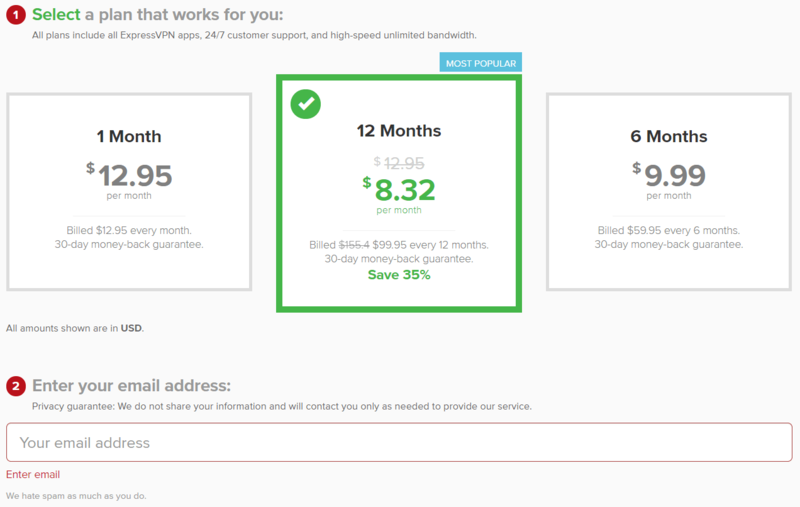 ExpressVPN’s subscription is a bit on the steep side when we look at their 1-month subscription option which goes for $12.95 per month. Their annual subscription, being their “cheapest” option is definitely getting to acceptable levels. It goes for $99.95 every 12 months, which comes out to $8.32 per month. Let’s not forget their top-notch 24/7 customer service. Honestly, there’s little negative to say about ExpressVPN – they’re that good. Sorry if you were looking for something to hate ExpressVPN for – there’s nothing we found! ExpressVPN was launched in 2009. Since then, it has been a pioneer in online privacy, gaining numerous mentions in the media. Its no logs policy was put to the test in 2017, when one of its servers was involved in the assassination of the Russian ambassador to Turkey. Authorities failed to uncover any user data, confirming that ExpressVPN is strict when it comes to protecting its users’ online activities. Also notably important, ExpressVPN operates under ExpressVPN International Ltd., located in the British Virgin Islands. Apart from being a beautiful island in the Caribbean, the British Virgin Islands is also outside of the 14 Eyes alliance. This means that government agencies from around the world cannot pull out your data and personal information from ExpressVPN… not that they are retaining any of your activities. This goes to show that ExpressVPN goes to great lengths to keep your information safe. In recent times, VPN providers are becoming more transparent by publishing audit reports from independent security firms. ExpressVPN is no exception. A team of four professionals from Cure53 attempted to penetrate ExpressVPN over a seven-day period. The results? A total of 8 issues, 4 categorized as vulnerabilities and 4 categorized as general weaknesses. No critical issues found. Although this test was only done on the Chrome browser extension, it’s definitely the right step forward for the transparency of the company. Especially now because they’ve just made the extension open-source. Dear @expressvpn, thank you for existing. These are just two examples out of many happy customers. Your experience may vary but it’s worth a try (especially with a 30-day money back guarantee). ExpressVPN is the most well-known VPN provider, and it’s very obvious why. We really did try to find negative things about ExpressVPN but we just could not find any. The contract is definitely within the “affordable” category, and this price-point is for the perfect VPN package. There simply is none better at being the best all-around. 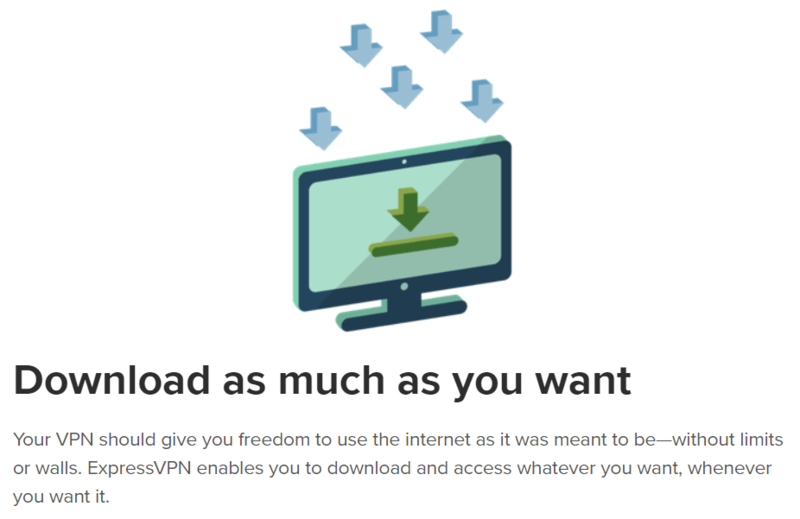 This is a VPN that has everything: top-notch security, fantastic download/upload speeds, easy-to-use UI, wide device compatibility, and amazing support – then there’s really nowhere else to look. 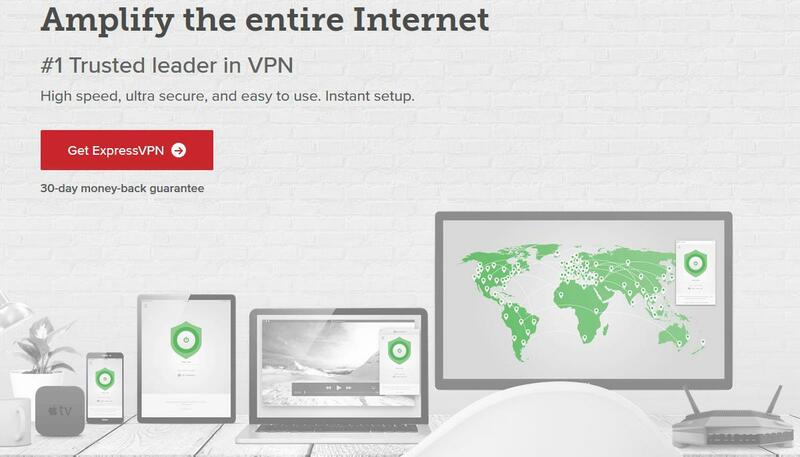 ExpressVPN is worth every cent, and we’re also keeping our subscription. + Wide device compatibility (even routers). + Audited by 3rd party security firm. - Premium cost for premium product (get 49% discount now).